Retail Price $24.99 0 1 Like this product? Speaker contains built in amp powered by rechargeable battery and Includes speaker cable with USB plug for charging speaker. 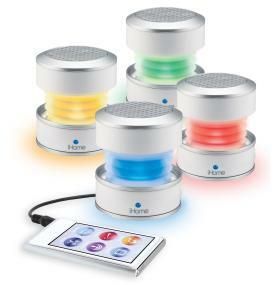 This speaker plays audio from iPad, iPhone, iPod, computer, handheld game system, other audio devices equipped with 3.5 mm audio jack. This is collapsible speaker fits in your palm for ultimate portability. The iHM61 is an amazing approach to audio that offers size defying sound. Speaker connects to a computer or other USB power source via the included USB cable to recharge the internal lithium ion battery. Remarkable vacuum bass design gives surprising volume and bass response in a speaker that fits in your palm. 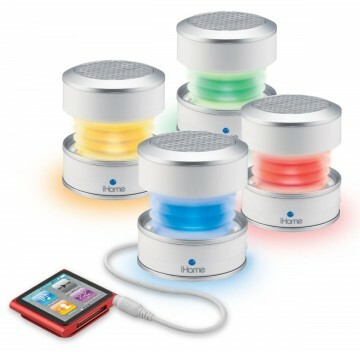 Perfect for laptops, cell phones, iPhone, iPod and other MP3 players, any audio source. Buy two for simulated stereo sound. The iHM61 series is a great addition to your already portable music. Enjoy hours of your music through this little but mighty portable speaker. The 3.5mm headphone jack is perfect for laptops, cell phones, portable game devices, and many other mobile devices. iHM61 has a vacuum bass design that provides surprising volume and bass response in a small space-saving speaker that fits in your hand. When traveling or wanting more treble twist the speaker closed or expand it for a deeper bass. The iHM60 volume control is administered through your electronic device. In just its first year, iHome became the #1 brand in the iPod Electronics market and its iPod Clock Radio became and continues to be the #1 selling iPod Speaker System in North America. iHome now offers full lines of alarm clocks, clock radios, portable speakers, home audio systems, headphones, and a licensed line of iPhone/iPad/Mac accessories. iHome supports its brand and products with national television, print, online and outdoor advertising campaigns, and has garnered several industry awards for its unique products and advanced technologies. iHome's products can be found worldwide through virtually every distribution network in over 70 countries.